Cheddar’s Scratch Kitchen is America’s favorite general menu casual dining chain, according to a new study by Market Force Information® (Market Force). More than 9,200 consumers were polled for the study, which ranks casual dining restaurant chains in seven categories: general menu, pizza, Italian, breakfast, buffet, steakhouse and seafood. This is the first time that Cheddar’s Scratch Kitchen has earned enough votes to be included in the rankings. In the hotly debated pizza category, Pizza Ranch took the pie with a score of 55%, with California Pizza Kitchen ranking second at 50% and Old Chicago nabbing the third-place spot with 43%. Others on the list included Cici’s, Round Table Pizza, Pizza Hut and Chuck E. Cheese. [See Graph 3]. Pizza Ranch, which offers a buffet-style service, was top rated for its menu variety and friendly service, and ranked in the top three in most other categories. California Pizza Kitchen earned the highest marks for quality food and healthy food options. Cici’s dominated in the value category and ranked first for fast service. Chuck E. Cheese was far and away the favorite for delivering an experience, rather than just a transaction. For the third time in a row, Maggiano’s has been named America’s favorite Italian chain, earning a 61% score. Carrabba’s Italian Grill received a 56% to again land in second place, while Olive Garden ranked third and Romano’s Macaroni Grill was fourth. [See Graph 4]. Maggiano’s led in most of the categories, receiving first-place scores for every category except fast service, receiving particularly strong marks for value, menu variety, experience and atmosphere, and tying for first alongside Carrabba’s for quality food and friendly service. Carrabba’s also led in fast service and healthy food options. Bob Evans Restaurants continue to delight diners who are looking to eat breakfast at any time of day. The Ohio-based chain once again ranked first among casual dining breakfast options, and Waffle House and Mimi’s tied for second. Village Inn ranked third, IHOP and Perkins tied for fourth and Denny’s was fifth. [See Graph 5]. Bob Evans took the top spots for menu variety and healthy food options, but Mimi’s Café won when it came to high-quality food. Waffle House was lauded for having the best value and fastest service. 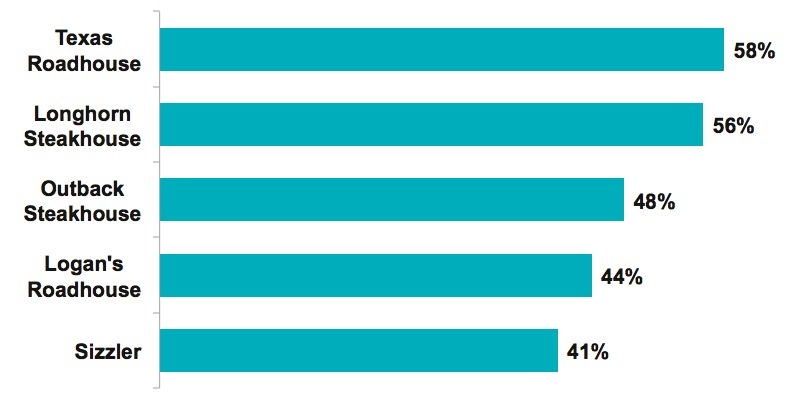 It also tied for delivering an experience, but the experience scores in the breakfast category were overall very low and tightly clustered, with no one brand standing out. 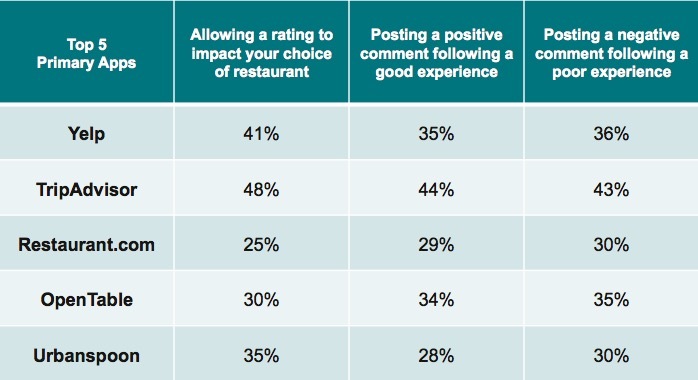 Market Force also looked at which buffet chains are leaving guests the most satisfied, and found that Pizza Ranch is a clear leader with 55%. Golden Corral overtook Hometown Buffet to rank second with 40%, and Cici’s Pizza ranked third with 35%. Hometown Buffet and Old Country Buffet rounded out the top five. [See Graph 6]. Pizza Ranch was found to have the best food, friendliest service and most inviting atmosphere. Golden Corral ranked No. 1 for menu variety and healthy options, and tied with Hometown Buffet for delivering an experience. Cici’s Pizza was the value leader. In the battle of the beef, Texas Roadhouse was the winner for the second consecutive time. It earned 58% to surpass second-place Longhorn Steakhouse, which received a 59%. Outback Steakhouse trailed with 48% and was followed by Logan’s Roadhouse and Sizzler. [See Graph 7]. Not surprisingly, Texas Roadhouse was the top scorer in nearly all of the categories that are most important to diners, such as quality food, value, friendly service, atmosphere, experience and variety. Sizzler was lauded for its fast service and array of healthy choices. 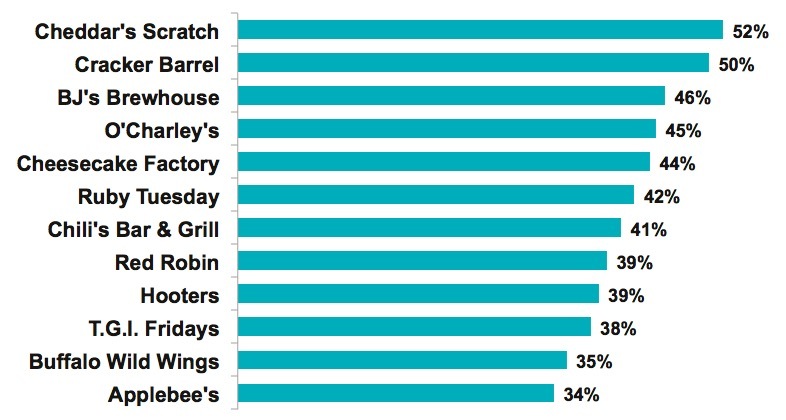 Longhorn Steakhouse performed wall across the board, landing in the top three of every attribute studied. Market Force received enough viable data to include a seafood category this year, after leaving it out of previous studies. Pappadeaux, which recently celebrated its 30th anniversary, led the pack with 62%. Bonefish Grill earned 55%, placing it second, while Joe’s Crab Shack was third with 49%, and Red Lobster was fourth with 47%. [See Graph 8]. Pappadeaux secured the highest scores in key food and service categories, including quality food, menu variety and fast service. Joe’s Crab Shack tied with Pappadeaux for friendly service and experience, and slightly edged it out for value. Bonefish Grill had a strong showing in the food-related areas, ranking first for healthy options and second for quality food and menu variety.